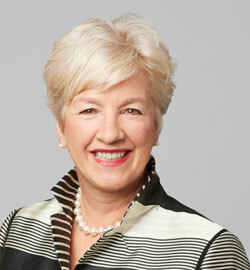 Home » OEN Networking Luncheon » Annette Verschuren O.C., Chair & Chief Executive Officer NRSTOR Inc.
Ms. Verschuren is a board member of Liberty Mutual Insurance Group of Boston, Air Canada, Saputo and Canadian Natural Resources Limited. In addition, Ms. Verschuren is a board member of CAMH Foundation and is Chair of MaRS Discovery District. Annette Verschuren was appointed to the Canada US Council for the Advancement of Women in February 2017 and she is a member of the Federal Government’s Advisory Council for NAFTA led by Minister Chrystia Freeland. Ms. Verschuren co-chairs the Smart Prosperity Initiative which is mapping out a course to a stronger, cleaner economy for Canada. In 2011, Ms Verschuren was honoured as an Officer of The Order of Canada for her contribution to the retail industry and Corporate Social Responsibility. In 2010, she was appointed co-chair of the 2012 Governor General’s Leadership Conference, Canada’s premier leadership training event. In June 2019, Ms. Verschuren will be inducted into the Canadian Business Hall of Fame. A champion of community investment and volunteerism, Ms. Verschuren serves as Chancellor of Cape Breton University and chaired fundraising efforts for the University’s new Verschuren Centre for Sustainability in Energy & the Environment (VCSEE) and still acts as an Advisor. Ms. Verschuren holds honorary doctorate degrees from eight universities including St. Francis Xavier University, where she also earned a Bachelor of Business Administration degree. Annette Verschuren wrote a business book “Bet On Me”, leading and succeeding in business and in life, published by Harper Collins.